What an adventure hiking Segments 15-17 of the Colorado Trail. Seventeen hours of rain resulted in significant gear failure and a trip termination. We drove three hours to Fooses Creek on Thursday afternoon to begin our hike. Parked on Highway 50, we followed Fooses Creek Road 2.8 miles to our campsite located just before the main trailhead. While it isn’t terribly fun to walk a road, it was part of the CT and to finish the WHOLE trail, we had to make the walk. Fortunately, the dirt road narrowed through some aspen groves which made it somewhat scenic and the intermittent sprinkle wasn’t too much of a bother. The rain continued off and on for the evening which was a little annoying while trying to enjoy an evening around the campsite, but is was nothing compared to what we had in store for us. We packed up our wet gear Friday morning and departed camp just before 8am. Dusty, Margaret and I had never hiked together before, though Margaret had hiked with others in our group who are segment hiking the Colorado Trail. Little did I know, Margaret who must be in her late sixties or early seventies, may be the faster hiker I’ve ever met. She can hike as fast as a twenty-year old male. As such, she took off and Dusty and I trailed behind. After about an hour into the trail, we found Margaret waiting for us. After this, I suggested we have a time or place that we meet…next stop 10 o’clock just before our last chance to filter water for five miles. During this time, we meandered through fields of waist high wildflowers that were just spectacular. I don’t know if they are always like this in the area or if it was due to the generally wet weather conditions over the last month. Regardless, they were a delight. 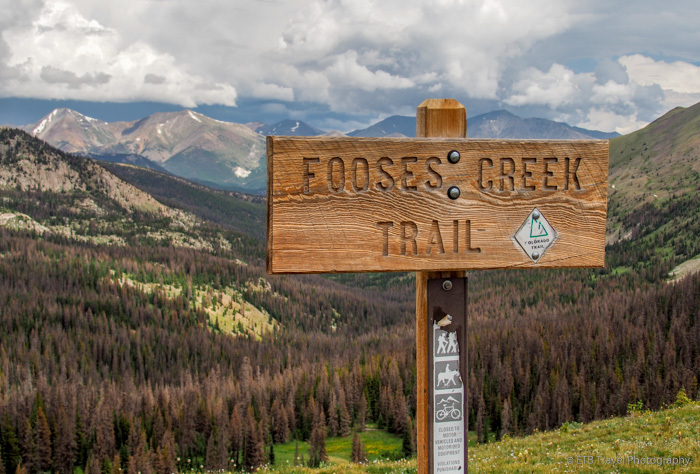 So far we had followed a gradual ascent to mile 8.2 where we ate an early lunch and filled up with water just in time to tackle one of the steepest grades on the entire Colorado Trail, a 668 foot climb over a ½ mile to the crest of the Continental Divide. We enjoyed the magnificent view before carrying on in a southeasterly direction. For the next few miles, we mostly followed the ridge above the treeline and admired the expansive views as we watched threatening weather in the distance. Soon, we dropped down onto a jeep road that ran through an evergreen forest. By 1:45 we had reached a piped spring for more water and descended to the end of Segment 15 at Marshall Pass. Our original plan was to camp in this area after hiking 11 miles for the day. Our early arrival, however, prompted us to aim for four more miles to a campsite near Silver Creek. Just as soon as we continued on, a light sprinkle fell from the overcast sky. The rain steadily increased, so we stopped quickly to slip on our rain gear. Margaret was still working on her pack cover while Dusty and I were waiting, so we told her that we would head on since she hiked much faster than us. This decision proved detrimental to our hike. We could see the trailhead at the beginning of Segment 16 from the road. As soon as we reached it, the trail split in two…the left-hand fork was marked with the CT sign and the right-hand fork obviously was not. The single-track rail ascended into the forest where Dusty needed to take a break. As such, she said she would wait for Margaret, and I would carry on being the slowest of us three. Within minutes, we ended up in the eye of the storm. Thunder clapped and lightning struck simultaneously. Fortunately, we were in the cover of the trees. With the weather coming from west to east, I opted to proceed hiking south to get out of the mess. I passed two hikers holding umbrellas under the two tallest trees in the forest. I thought to myself, that is a loaded gun. Anyway, I passed through the forest on the narrow path (or should I say narrow stream) while stopping every now and again near small trees as thunder boomed. I was slightly chilled while resting, so I only waited a few minutes at a time to keep my core temperature up. I thought that Margaret and Dusty would have caught up to me by now, but since they hadn’t, it seemed they must have hunkered down somewhere. After four miles and two hours in the rain, I had reached the proposed campsite on my own. I asked a passing mountain biker if he had seen them, and he described one girl that fit Dusty’s description. About ten minutes later and now a chill in my bones, Dusty showed up. The first words out of her mouth were, “So I guess Margaret isn’t with you?” The deduction was accurate! So, at this point, Margaret had been missing two hours. We decided to give her until 6pm (or two more hours) to show up before we called search and rescue. In the meantime, Dusty and I hiked down to Silver Creek Trail with our packs on as we needed water and there was supposed to be good camping in the meadow near the creek. Aside from one nice campsite with a dead tree that Dusty did not want to camp near, the others were limited, spread out, and too close to the creek. Now, really drenched and really cold, I was willing to risk the dead tree falling over hypothermia setting in, but Dusty felt better being on the main trail while waiting on Margaret. We wandered around some more while looking for a site as virtually the whole forest was dead from beetle kill. Eventually, we settled on an open space near the trail junction and hoped for no lightening. I guess there is always something to worry about in the elements. My gear, despite being packed in trash bags was rather wet. Dusty’s was somewhat damp. We have decided single wall tents are useless in rainy conditions. I’m not sure they are worth the lighter weight! 6pm came and went…no Margaret. As such, we texted Dusty’s husband through Dusty’s Delorme Satellite Phone (which I think I will invest in), and asked him to call the Sheriff. Messages trickled back and forth for a few minutes, when suddenly a man stopped at our tents and asked if we were hiking with another lady. “Yes, in fact, we have been looking for her,” Dusty responded. Margaret showed up a few minutes later after having taken the wrong trail for five miles and then having to backtrack. What a relief it was to find her and call off search and rescue! Lucky for her us, her tent with a fly was dry. Unlucky for us, it was a single person. That didn’t matter at the time. We three ditched our wet belongings in my tent as it was rendered useless and all of us squeezed into her tent for warmth. We didn’t think we’d all be in there for the next FOUR hours, but it never stopped raining!! Around 10pm, the drizzle let up for about eight minutes. Dusty made a run for it and settled into her damp, but warm enough space. Margaret and I laid uncomfortably on rocks with one sleeping bag between us until morning. I doubt if any of us slept more than an hour or two…I know I didn’t. At 6am, it was still raining…7am, the same…8am, no change. At this point, all of us agreed to abort as it didn’t seem like the sun was ever going to come out and we wouldn’t be able to dry our gear. Dusty texted her husband to come get us…at least a four drive. In the meantime, we had to hike four miles back to Marshall Pass. After 17 hours, the rain stopped around 9am. We made a “run” for it! We were going to be at the pass well before “pick-up” time, so we hoped to hitch a ride down the thirteen-mile dirt road to town or set up Margaret’s one-person tent for shelter should the rain begin again. We were hiking southbound while others in our group were hiking northbound. We had planned to meet in the middle to exchange keys to our cars parked on the opposite ends of the trail. We were now abandoning them without a key. Fortunately, I brought a spare key with me in case we missed them on the trail and this was a Godsend. At the same time, I was stressed about them not knowing our whereabouts. Without cell phone service, the only thing we could do was pass a message along with through hikers that their key would be at their car, likely on the front left bumper. Like the old game, “telephone”, we gave the message to about six hikers. Come to find out, Mike and Ross received the message, though convoluted, as they hiked through the rain for the next two days to the car! This was a great relief to me. Upon reflection, while our hike didn’t go as planned, ultimately, we made the right decision as our gear would have never dried under the conditions, a deluge of rain for three days. Having said that, we learned our lesson not to split up and to perhaps even stick with our original plan which would have kept us dry by camping at 2pm. It is interesting to note, if we were hiking individually and not in a group, we all would have made a different decision which was to pitch a tent where we were, but without any form of communication between us, we knew we had to make it to mile 4 on Segment 16 as that was the plan we discussed. Now, back to hiking…Miraculously, we reached Marshall Pass and the cover of the pit toilet just before the rain ensued. We ate a snack as we patiently waited for anyone passing by with a car. It didn’t take long before a mud-covered, drenched mountain biker joined us at the bathroom…then another one. They wondered aloud, “Where is the closest motel?” Many of the mountain bikers were competing in the Leadville 100, and the race had dwindled down to 21 competitors as the conditions frankly SUCKED! We three piled in the back as Deanne, Danny and their dog Penny drove us down the road to the convenience store in Poncha Springs. It turns out, they were camping near their and had randomly taken a scenic drive up to Marshall Pass. They wouldn’t accept gas money, beer, or lunch, so we graciously thanked them for being our trail angels. We happily waited in the dry cover of the convenience store for the next hour or so until Dusty’s husband retrieved us. Previous Post Roadtrip to the Rockies: From Crested Butte to Aspen! What an adventure! Glad you made it home safe and sound!